A free advice post about business, process, continuous improvement, leadership, culture change, product development, management, Lean, Six Sigma, quality, and generally making things better. It is a truism of life that our energy goes where our focus is. If we fixate on a problem, our energy goes into the problem. However, if we focus on the solution, our energy goes into solving the problem. In the last few years, I have had the luxury of sharing a fair number of problem-solving challenges with colleagues and friends in several businesses. While reflecting upon that collection of experiences this week, I observed a single distinction between those organizations that struggle to make headway against a perpetual storm of broken processes and those that succeed in making things better. That difference is each organization’s attitude about improvement and where the personnel focus their attention. Those organizations that are stuck and fixated on problems always have problems that don’t seem to get fixed. Alternatively, those organizations that focus their intent upon a solution, even if it isn’t a great solution, make strong forward progress and develop a successful habit of solving problems and making work life and business better. I’ve often said and written that what is true in life is true in business. I believe the phenomenon I describe is an example. Pick your favorite sport or hobby. Somewhere in there is a direct correlation to focusing on solutions instead of problems. Here are some examples that might seem familiar. Anyone who pilots a motorcycle, (or slalom skis) has heard the phrase, “You go where you look.” We are trained to look through the turn to a point down the road, or racecourse, where we want to go and our vehicle goes there under our guidance. If you look at the ground right in front of you, you crash. It’s the same in baseball or golf. In order to be sure to hit the ball precisely, we are directed to keep our eye on it. If that doesn’t mean anything to your experience, try this one. When a family member speaks to you while the TV is on, look at your family member. It will be easier to ignore the TV and listen to your family if you are looking at him or her. Our efforts are directed, both consciously and unconsciously by our focus. In the examples I gave above, our focus is controlled by our gaze, but the phenomenon translates beyond just our eyesight. Therefore, the idea of focusing on a solution instead of a problem should not sound so much like an empty platitude. The challenge, if we accept the concept, is to recognize when we are fixated on a problem and to adjust our focus. Here are some examples of things said and done at organizations fixated on problems instead of solutions, to fuel our thought. Conversations among team members continuously revert to complaints or observations about what results the problem produces. Debate centers on what affects the problem has, or how often it occurs, or who is affected. Personnel continuously find ways to work around problems. Personnel talk about how to make a defective part, system, or form, work even though it is defective. Personnel talk about problems or complain about them, but don’t act to change them. Over-analysis: we keep pulling out tools or holding meetings to find new ways to tear apart or describe a problem, but don’t make a decision. Compare those behaviors to these that were far more common in organizations that focused on solving the problem. A definition of the problem is quickly established and discussion focuses on root cause and potential solutions. Debate centers on which solution to choose. People don’t work around or follow broken processes; they stop and fix them. Personnel talk about what they want to do or are going to do instead of talking about what is stopping them from succeeding. The trick to knowing when we are focused on the problem instead of a solution is not so explicit as a list of catch phrases or specific actions. We must listen and observe. If our words and our actions center on working with a problem in place, we are focused on the problem. When our words and our actions center on a future state where the problem is gone, then we are focused on a solution. To migrate from the former state to the latter, begin with yourself. Take notice of your own words and actions. If you catch yourself talking about problems instead of solutions, make a conscious effort and habit to re-state your thoughts, right there and then, to something solution focused. Do the same for your colleagues and personnel. Understand that our words and our actions result from our thoughts. Our thoughts represent our focus. If we catch words and actions focused on the wrong thing, we can use that moment to redirect the thoughts behind them to a more constructive posture. Stay alert and observe carefully the words and actions you and your fellow teammates produce this week. If they seem more focused on problems than solutions, start actively redirecting that focus. It has been a clear distinction between organizations that solve problems and improve and those that wallow in dysfunction in my experience. Focus yourself and your organization on the right destiny. Successful performance change comes from changing behaviors. Not only must we deliberately configure those things that influence behavior, we must have a plan for managing and monitoring the change. Here is a useful tool for planning and tracking behavior changes. Part 1 of this post series discussed the importance of behavior on business performance and, particularly, on the strategy of making behavior the primary focus of our plans for directing and facilitating a business performance change. Part 2 introduced a few of the major influences on behavior that we can control to help drive the desired behavior and outcome. Here we will examine a relatively simple tool for planning the behavior change process. Leadership and communication are the most important tools for driving behavioral change and developing a culture that we have thoughtfully designed. Consistency is the key to helping everyone perceive the new way of doing things and adopting it and adapting to it quickly and easily. The tool below is a single-page communication and planning tool that we can use to quickly and effectively share the plan for, and the progress of, our change. Some of the lessons that I share on my site are things I have picked up from my own observation and created myself. Many of the things I share are lessons and tools that others have shared with me to help me grow. This particular tool is one very similar to a matrix used by a former employer. While I have taken some minor liberties for the sake of this post and for making it easy to communicate the important elements, it is not my own creation. If I knew who the genius was who introduced it to the company, I would gladly give him or her credit and acclaim. It evolved somewhat from its original introduction format and I was given to understand that it was modified from a plan for personal outlook and behavioral modification that the “originator” picked up at a self-help workshop. Just as what I present has evolved to meet particular needs for others, so should you feel free to modify it to meet your business and communication methods. As you customize the tool, be careful not to lose sight of the important elements, which I will point out, nor to sacrifice the effective beauty of this tool’s efficient communication. Even when applied exactly according to template or as presented herein, it can lose its effectiveness when it is overcomplicated. Keep it simple, make it fit to a single page, or a single poster if absolutely necessary, and keep the language clear and concise. There will be room for detail and explanation elsewhere. Figure 1 and Figure 2 show an example of the tool. It is a simple matrix. 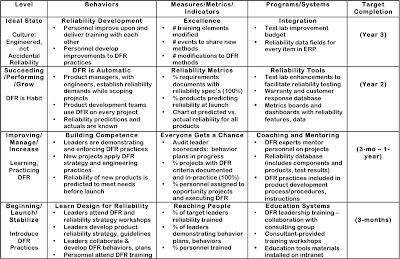 In this example I have notionally laid out a plan for introducing a Design for Reliability methodology into a product development organization and culture. Make a screen shot or copy of the figure to which to refer while I break it down below. The first thing that becomes apparent is that the matrix clearly focuses on behaviors as the primary topic and that the change or development of those behaviors is planned in stages. Also, a glance at the last column demonstrates that we do not expect behaviors to settle in and become habit overnight. Change is a process. It takes time. We can build the matrix top-down or bottom up. In this example the beginning and baseline, starting place are at the bottom and the utopian state is at the top. If it suits your way of thinking and your organization’s habits to build it with the beginning state on top and the final state at the bottom, feel free to build it that way. The baseline row of the matrix can come in handy to clearly communicate what behaviors we are trying to build upon or leave behind, but it doesn’t otherwise contribute to the plan and it does take up valuable space. I recommend it if you must establish a common agreement about the current state and what is well or poor about it, or if you are finalizing some earlier initiative to stabilize the organization and want to build upon that. Otherwise, it is not especially valuable. I strongly recommend at least three levels of cultural or behavioral development, a beginning stage, a developmental stage, and a “achieved” or success stage. In the example above, a rather lofty vision is described in the highest level. Many leaders like to set a vision of world-class virtue and encourage followers to aspire to it. I agree with this approach and encourage it. I like the idea of developing to a level that we are improving upon what we were taught and making the entire process or concept or methodology better than we learned it. This is a good goal for the top level. If we set those high expectations then we definitely want to drive and strive for them, but we should understand that the development of the behaviors is successfully fulfilling its business needs at the level below, which we describe as “success” or “habit” or “fulfillment” or some other similar state in which the organization is truly executing and living by the behaviors we set in motion. The best way to think about how to fill this level of the matrix is to answer the question, “What does ‘done’ look like?” Build your answer into this row. Below the success or fulfillment stage is a stage wherein our people are developing their proficiency with the new skills or methods and becoming more comfortable with the behaviors that we expect. This takes time and leadership and practice. This is where the learning curve is taking place and we, leaders and personnel alike, are learning from our mistakes. The beginning stage is where we introduce the new behaviors and set expectations. In Part 2 we discussed the importance of having leaders, both natural and leadership-role leaders, spearheading the change and demonstrating the new behaviors for others to witness. This is the stage where that element must be set in motion. This is also the stage where much of the training and communications concerning expectations takes place. The baseline row simply describes the current state. We can include our strongest traits as building blocks, or we can display the behaviors we want to leave behind, or both. Examining the columns from left to right, the first is simply assigns a name for each stage. Use language that fits your organization’s personality or culture. Active verbs send a signal of activity. In the example above is a title for the stage as well as a few key words describing the objective or focus for the stage. The second column describes the specific behaviors you need to establish or expect to see that enable and power your business performance change. In the early stages they are often behaviors linked to training and learning, or otherwise becoming familiar with the new skills, methods, rules, processes, and behaviors. As the matrix moves through the development of our new habits we modify the behaviors in the second column to describe the process of developing from learning, to practicing and developing proficiency in the second stage, and finally to demonstrating that the new behaviors are habitual in the third stage. As mentioned above, the final stage might describe a state where the population is improving upon the new behaviors. The third column is our feedback section of the plan. This column focuses on describing how we know that the behaviors are happening. Alternatively, it may be used to identify metrics that we believe will inspire and drive the behaviors we want. Be careful with the latter. Many times our metrics don’t necessarily drive the behaviors we want, but inspire behaviors we don’t imagine until they manifest. If we use metrics to inspire behavior, I strongly advise coupling them with simple audits or data points that will only measure how often the behaviors we expect are actually taking place, and in the manner we expect. I believe that leadership is a better tool for guiding the development of behavior than are metrics. The fourth column lists the support elements that must be installed in order to facilitate the new behaviors. This might include training materials, equipment or equipment configuration, policies, data systems, processes, templates, software systems, committees, positions or new roles, experts, and etc. In Part 2 we discussed how systems and programs that don’t cooperate with our new expectations and behaviors can and will inspire resistance and often sabotage our initiative for change. This column is a place to record and communicate the necessity for various programs or systems important to the change process. The development of programs or systems often must change and can afford to develop along with the progress in our behaviors. Line the element up with that understanding and vision in mind. Sometimes we want to identify the obsolescence of certain systems or programs. That is also a valid line item for the fourth column. The fifth column is, in my opinion, the least important, but also the most unavoidable in most business cultures. It is true that where there is no deadline, there is no urgency, and we can’t allow our initiative to languish and die. However, we must recognize that any dates or deadlines that we put in the target completion column are arbitrary. We, none of us, really know how long it is going to take for the behaviors in our organization to develop. Sometimes it takes less time than we think to train everyone, but more time to lead everyone through the development of skills. Sometimes getting everyone through training seems to go on forever, but people adopt the new methods immediately because they are a vast improvement upon the status quo. My advice is to set targets in the last column, leaving room for a change process to occur, and then encourage everyone to demonstrate that they have moved to the next stage before the target date arrives. Offer positive incentives or inspire friendly internal competition to do so. If it’s not possible to meet the target you set when you dreamed up the matrix, accept it and adjust. Concerning tracking progress, use any method you like, such as color, or strikethroughs, or check marks, to note on your matrix when one of the behaviors, measures, or systems, or programs is successfully completed, established, or fulfilled. Fight hard not to let anyone backslide and force you to remove your mark from the matrix. If that happens, make a big deal about it. When the items in each block of each row are checked off you can claim that you are truly in the next stage. If you find yourself checking off behaviors in the next stage before you have completed the systems in your current stage, then this is your warning that your pace of system and program development is not keeping up with your organization’s development of new behaviors. If your systems don’t develop fast enough, you can run into trouble and can sabotage your so-far-successful culture change. Be very alert to this and adjust quickly. If your programs and systems develop faster than your behaviors, there is less threat. Instead, it becomes your opportunity to drive your leaders to push harder to facilitate the behavioral change. Let’s briefly discuss the titles of the various blocks. In our templates for this matrix we may set specific titles for each block if we like. We could name the behaviors, measures, and programs blocks at the beginning level, “Communicating Expectations,” “Setting Expectations,” and “Establishing Program Elements,” respectively, for example. This can be useful since it creates a standard or pattern and everyone becomes accustomed to the typical change plan. However, we can also use the titles of each block to concisely communicate a theme or objective for each piece of the matrix. Some category ideas for the behaviors might be as follows. Some block titles for the feedback (measure, metrics) column blocks might be as follows. Some block titles for the systems or programs column might be as follows. The point is to use the block titles to create a meaningful context for the very brief phrases of key words that are inside each block. Remember, the idea is to make the matrix fit on a single page of some practical size. It is a communication tool as much as a plan and tracker of progress. Therefore, every character should fulfill some meaningful purpose. The magic to the matrix is not the matrix (unless you appreciate the elegant simplicity of putting an entire plan for cultural change or development onto a single piece of paper); the magic is in your plan, which is only communicated through the matrix. Use the matrix and the elements listed in Part 2 of this post series to inspire and list the important elements of your plan, but make a very careful plan around the ideas the matrix and the list mentioned inspire. Your plan will no doubt require much more detail than the matrix above can contain. For example, if your plan requires developing or modifying a data system within your Enterprise Resource Planning (ERP) system, that very system element will require some careful thought and planning. You may produce as much supporting information, or as many diagrams, lists, charts, or dashboards as you need. Just keep the matrix simple so that it fulfills its purpose as a means of concisely communicating your plan to everyone affected. Be creative, take your time, be careful, and most of all, make the matrix work how you need it to for your needs. It’s just a tool. Use your own language. Make it bolder and more colorful than the generic black-on-white shown herein. Make it interactive with links from key words to deeper levels of the plan. Just don’t sacrifice the elegance by making it overly complicated. Behavior is key to performance. To change the latter we must modify the former. It seems to be a crucial understanding that is left out of the various business improvement methodologies we seek, learn, or introduce. Please give some serious thought to how, as you introduce your new methodologies, whatever they are, you will plan and facilitate the necessary behaviors that will make your successful institution of the methodology. Behavior change is certainly more complicated than a short list of behavior-influencing elements and a single-page matrix can capture. However, I hope that the list of elements I provided in Part 2 and the matrix tool described above give you a solid starting place for planning the behavioral needs mentioned in Part 1. The thoughts I’ve provided are those that most often mean the difference between success and failure in my own experience in driving change. Take a look at your methodology, initiative, or program plans. If there are elements described in this three-part post that you have not addressed, use the ideas discussed to fill in the gaps and be successful. We don’t successfully drive business performance change just because we reorganize and declare some management objectives. We change performance by changing behavior. Consider several important elements that influence behavior while drawing up your behavior-change plans. In Part 1 of this post thread, we discussed a number of arguments for why our business performance only changes when our fundamental behavior changes. Specifically, we must address the way we respond to challenges or stress, our decision-making habits, how we address and solve problems, and our general daily conduct. Unfortunately, the various business performance improvement programs such as Lean or Six Sigma, just to drop a pair of names, and the consultants that introduce them to us, don’t really address how to plan the behavioral change throughout our organization that will enable these programs and systems to truly succeed. Much more than training, some new metrics, and reorganization is necessary. For this part of the discussion, let’s look specifically at some of the cultural and business elements that influence behavior. These elements must be included in a plan that specifically addresses changing behavior. Here is a short list of the elements to discuss. They will seem fairly obvious at first glance, but I dredged this list out of a pile of notes concerning the failures and roadblocks that I have fought to correct or remove in my own change-driving experience. In other words, even though they are obvious, or because they are obvious and we take them for granted, we fail to address these elements in our change efforts. This list includes the most commonly recurring themes. It is important to point out that when we discuss behavior we are ultimately addressing our business culture. The elements listed above are like ingredients in a stew. Most stews will have common ingredients, but every chef’s blend and recipe will be different. Use the list herein as a starting place. Give some thought to your organization’s own unique needs and cultural flavor to completely flesh out your plan for behavioral change. Perhaps the most important element to set your change up for success is for your leaders to model the behavior you want to drive. I’m amazed at how often this need fails to manifest. More than once, I’ve been involved in an initiative to install Six Sigma into a business organization and the management teams were the last organizational elements to be infused, rather than the first. If the leaders are either too busy or too resistant to attend training and start speaking the language, how should we expect everyone else to be motivated to buy into the change? How well will that change actually manifest if the leaders don’t understand what everyone else is talking about or trying to do? Can people behave differently if their leaders are still stuck in the old ways? Of course not. Still, it happens frequently. Leaders must be the first to adopt the new ways, not the last. Leaders must both push and pull the new behaviors through the organization. If the leaders don’t demand it, it won’t seem important. If the leaders aren’t doing it themselves, it won’t be important or practical. To change the behavior of our people, the change must seem both inevitable and possible. It must be easier to change than to remain the same. It becomes easier to change, even desirable to do so, and harder to resist if the organization’s leaders have already made the change and demonstrate it daily. One final thought regarding modeling the desired behavior. The word “leader” is not limited to those people in management or leadership authority. “Leaders” are those people in the organization that others go to for advice and support. They may be senior engineers, unflappable project managers, or the new college graduate with infectious optimism and a surplus of enthusiasm. By all means, start your change with your management, particularly the executive management, but also start with the other leaders in your organization. When the leaders adopt the new behaviors and methods, everyone else will follow. If your leaders become part of the resistance, your change is doomed. Many times, when we endeavor to introduce new behaviors, new guidelines aren’t enough; we also need new skills. This is especially true if we are introducing one of the popular programs such as Six Sigma, Lean, Outcome Driven Innovation, Axiomatic Design, Value Engineering, SMED or any of a long list of program names. Sometimes too there are concepts or new language we want to introduce. As you plan your change, make a list of the new skills, concepts, or terms that your personnel will need to learn. Make a plan for how to introduce the new skills, ideas, and language to your personnel. Be sure too that your training goes a step further than typical. As part of your training, include some demonstrations and expectations of the new behaviors that accompany the new skills. Don’t just introduce the new terms and skills or tools and think that your training is done. Model and demonstrate how and when you expect those new tools and skills are to be used. Use your training to establish expectations as well as introduce new methods. Remember this. Training is necessary, but it is not a solution. Training doesn’t make a person skilled; practice does. Also, training doesn’t make us automatically want to do things differently. We must follow our training with coaching and mentoring, and we must push and pull the use of the new tools and methods until they become habit. The biggest mistake that occurs most frequently is that organizations and change leaders train personnel and think that because people are trained they will now do things differently. It doesn’t happen that way. Make a plan for how your leaders, who are of course modeling the correct behavior, are going to coach and mentor their teams and personnel through the indoctrination of the new way. Make each leader establish his or her own plan for how he or she will do so. The leaders should be able to quickly and clearly articulate their plans. Actively discourage an unwillingness to participate, but don’t discourage or punish mistakes. When we are learning, we make mistakes. We learn better when we make mistakes and analyze them. No one will want to try something new if they are afraid of making mistakes while on the learning curve. Accept that mistakes will happen; coach people through them. Mentor people through their first few tries. Focus on establishing the behavior more so than results. The results will manifest if the behavior changes. Whether we mean them to or not, our systems often inspire or even dictate behavior. Sometimes we work around the systems that don’t cooperate. Sometimes we feel trapped in a particular sequence of steps because the system dictates that things must happen that way. Consider what systems, policies, processes, machines, software, or logistical chains will be engaged by your new way. The unfortunate answer is probably, “all of them.” Spend some time investigating them with the user experts of those various systems and determine if they are configured to work with your new behaviors. If they are not, make changes. It can be tedious and seemingly unrewarding to dig into your various systems in such a way, but when software or policy stand in the way of behaviors you are trying to drive it can be not only frustrating for you as a change agent, but also for those people trying to meet your expectations. It can be crippling to allow a system or policy to roadblock progress. Traditions or beliefs are not something we generally think about when discussing our businesses. Especially in western corporate business culture, we prefer to assume that everything is about the numbers and logical associations. Our organizations are made up of people, however, and every organization has it’s own flavor or culture, which is comprised of common behavior established by tradition and belief. Addressing tradition and belief takes some careful consideration and long thought in my experience. Break down you plan for addressing them into three parts. What traditions, habits, or beliefs do you need to get away from? What traditions, habits, or beliefs do you need to keep? What new traditions, habits, or beliefs must you install? Change means that some of the things we currently do, we must stop doing. Identify these things. Put words to the beliefs that drive them so that you can recognize when the cause for the old ways is inspiring resistance. Make a plan for the old ways to go away peacefully. Try not to challenge or refute existing beliefs. Belief systems do not need proof to inspire devotion; they only need faith. When we challenge beliefs we tend to inspire people to dig in and fight harder to maintain those beliefs. Instead of saying that old beliefs are wrong, suggest that a new belief might enable additional success. Offer new beliefs instead of challenging old ones wherever possible. Some beliefs and traditions are good and you want them to remain. For example, your family-owned business might have some well-established family-focused values that you do not want to damage. Identify the habits and traditions that define your strengths and that you want to protect or maintain. Identify the beliefs and values that drive those habits and traditions. Make plans to reinforce those beliefs and values as you go through your change. Make plans to ensure that the important-to-preserve traditions are continued and exercised. The best way to ensure that your change doesn’t inadvertently dissolve important cultural elements that define your business is to plan for the protection and perpetuation of those elements. Don’t let them be sacrificed by accident. As we set expectations for new behaviors, consider the beliefs upon which those behaviors are based. Design traditions that will reinforce expectations and inspire good habits. New traditions might include reward and recognition or otherwise display the success or benefits of your new business methodology. We often just assume that our environment will change as our business and behaviors change. The assumption alone implies a link between environment and behavior and our intuition about that link is not wrong. If there is a link, then why should we not use it to help drive the behavior change? Environment can be significantly influential. Sometimes environmental influence can be closely tied to the systems considerations mentioned above. Consider the following. If your new focus is to encourage intimate, focused teams to drive rapid problem solving, do you have enough meeting rooms or workspaces for these teams to meet and synergize? If your new focus is on efficiency and single-task resource planning, is your environment conducive to such, or is it noisy and full of distractions? If you are trying to drive creativity and innovation, is your work environment inspirational, or is it sterile and dull? Consider how your work environment does or does not fit the new behaviors and methodologies that you driving. Consider the messages on the walls, the arrangement of personnel, lighting, colors, noise levels, access to important systems, equipment, people, or interactions between groups. Make plans to proactively adapt your environment to your new change. Not only will it positively influence the change, it will communicate an additional message of devotion and dedication to the new way. When you lay out your plans for a business change, be sure to establish purposeful plans for driving behavioral. At a minimum, include elements of leadership modeling behavior, training, coaching and mentoring, system alignment, traditions, beliefs, and environment in those plans. If you take the time to work with your leaders to include these elements in your plans for business behavioral change, you will address many of the failures and roadblocks that prevent so many other organizations from successfully installing the programs they expect to improve business performance. It is well worth the extra planning to address these common sources of change failure and instead use them to drive success. In Part 3 of this post thread, we’ll discuss a framework for mapping and articulating your change plans. It can also be used to track progress and monitor the change as it occurs. It is not enough to simply reorganize your team or business and declare some management objectives to truly change business performance. Our performance stems from our behaviors. Changing behaviors takes careful planning. History, politics, and warfare have many lessons we can learn. Without getting carried away, consider the history of political revolution. Why revolution? It represents occasions in history where the fundamental performance and behavior of a large group changed. Look there for the keys to successful change for our own businesses. In my research and reading about political revolution, not once did revolution occur or succeed because a revolutionary leader declared, “Here is how we will organize ourselves and here is the message we will tell the population.” Actually, it is absurd to think that those actions would drive a successful revolution. Unfortunately, those are the actions business leaders take, over, and over, and over again to declare and promote and drive change initiatives. Granted, business change seems much less drastic than political revolution, but I argue that the fundamental keys to success are the same. In examining political revolution, those that successfully changed the government were driven by a general demand for a change in behavior. They were culturally driven, motivated by a desire that things not be done the same way anymore. The organization and “management” dictums were secondary, or even an afterthought. Therefore, if we want to successfully change the way our businesses perform, we must compel that change at a behavioral level. If political history isn’t your bag, then consider it logically. The performance of our business stems not from policy, from who reports to whom, or even really from the directions and priorities we give our managers. Fundamentally, our business performance is determined by how our personnel and managers and leaders make decisions, respond to problems, and how they do their daily work. If we want to change performance, we must change how decisions, responses, and work are made or done. If you still aren’t convinced that behavior is the right place to focus, then consider the dictionary definition of the word. Here are three. Think about those definitions. Now consider them in the context of your business or your team. How does your team respond to stimulus such as pressure to do things faster? How does your business respond to demand greater than it is prepared to meet? How do your people conduct themselves when faced with a problem? How does your business culture conduct itself on a daily basis? If you are trying to improve efficiency, or reduce variation, or eliminate waste, or increase innovation, is not that thing that you are truly trying to affect the way that your business, your teams, and your people respond, function, or conduct themselves? Absolutely it is. Now, If you report to a new boss, will that change your fundamental behavior or the way you do your work? Not by itself. Certainly you will adjust how you respond to your leader, but not necessarily how you conduct yourself otherwise. Not unless your boss demands such a change from you. Likewise, if you have a new metric, or a new priority, will that change your daily conduct? Will it change the way you solve problems, or a decision to do what is easy rather that what might have better long-term benefits, but is not rewarded in any way? 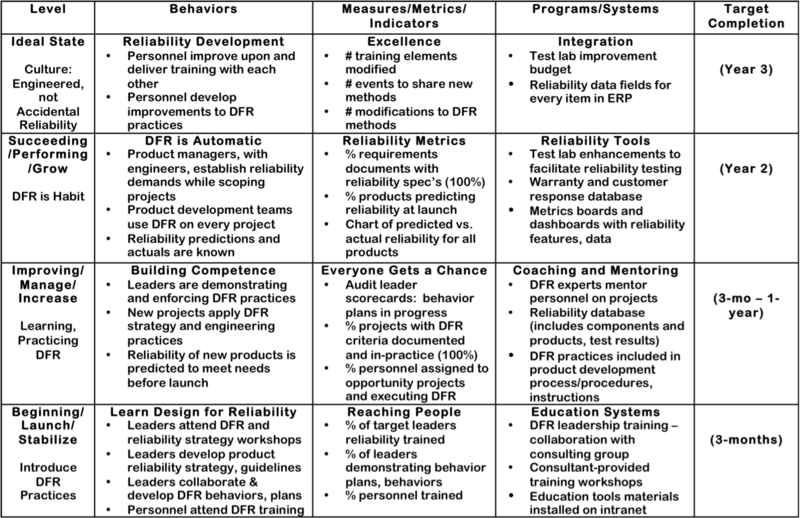 Metrics, priorities, and management dictums can enable certain behaviors to be easier or harder, but they don’t fundamentally change how we do things. If we want to change our performance in the work place, we must change behavior. We must change how we respond, how we function, and how we conduct ourselves. Behavioral change is the key to true performance change and it doesn’t come from new organization, new metrics, new vocabulary, or management direction. Even training is not enough. One of the biggest mistakes is to expect that because someone is trained in a new method that they are good at the new method and that they will use the new method. Answer this. If I sent you to auto mechanic school, would you be suddenly expert at fixing your own car? Would you fix your own car or would you still pay someone else to do it? I’m sure answers to the last question would vary. The same happens in the workplace. Answers will vary, and unless the general movement of the greater whole is toward doing what the training promoted, most will not change. In fact, the general phenomenon is for people to resist change, not adopt it. Therefore, training by itself is not effective and driving change. It is necessary, but not a solution. So, if organization, metrics, vocabulary, direction, and training are not enough, what does it take? It takes leadership through interpersonal influence. It requires pressure such that it is easier to change than to remain the same. It requires relentless communication. It takes planning. At the end of this post are links to others in which I have shared thoughts concerning interpersonal influence, pressure to change, and communication. In the following posts, Parts 2 and 3, I will endeavor to articulate a framework to plan actions and elements that will help drive the change in behavior. In particular, there are several elements of your action plan to consider, and there is a process that must be enabled. In case it isn’t obvious, the point of this post, Part 1 is to harp on the importance of focusing on behavior when planning change. Over and over we have all seen that organization, management direction, metrics and training are not enough to manifest the performance improvements our initiatives promise. Instead we move from one disappointing initiative to another and fuel the disease of passive resistance whereby our personnel play along politely while waiting for the initiative to die, and deliberately don’t change how they do things. Break the trend. Proceed to Parts 2 and 3 to examine a framework for planning change. First, however, take the most important step. Accept and understand that to truly change performance, we must change behavior. When planning your change initiative, your plans must focus foremost on behavior. Real change doesn’t happen just because we reorganize and declare a new initiative. Change occurs with behavior, which requires leadership and interpersonal influence. To influence change, agents must address change at a personal and interpersonal level. We have all experienced it. Our leadership gets an idea to drive some new way of doing business or driving process improvement and the business gets reorganized, management gets new orders, and some people, if not everyone, gets some training. Then we are told to go forth and make the new way happen. So we start using a new vocabulary, and maybe some of our metrics change, but in the end, the results we were promised don’t manifest. So, our leadership takes action, primarily focused on the middle management. Those who obviously disregarded or challenged the new way are reprimanded or eliminated. Others who were caught giving lip service, but not truly buying in are given similar attention. Still, the results promised don’t manifest. Eventually, the debate over whether the new way even works runs tired and we either decide that it doesn’t or that the results we have are the best we are going to get. Finally, our leadership either reads a new book, or it changes over and a new declaration for a new future is made and the cycle starts over again. I’m sure that, even as over-simplified as my description is, it sounds familiar to just about everyone. Why is it that these programs and initiatives and ways of driving success seem to work for the founders, and for a few rare businesses that follow the founder’s methods, but fail so often for the rest of us? Fundamentally, the change never takes place. Yes, we reorganize, and we address management directives, and even management personnel, but the change doesn’t occur. In the end, the business is still doing business as usual. Consider this. If I reorganize your business so the people are reporting to different leaders, does that fundamentally change how they do their work? No. If I give orders to your management to track new metrics and to use a new vocabulary, does that make the people do their work differently? Not fundamentally. If I give everyone in your business a week’s worth of training, does it make a person do his or her work in a different way? Not necessarily or probably not. What does make everyone in the business start to do things differently? (play game show music here) The clue is in the words, “the way we do work.” To some degree we can change people’s “ways” by changing process. However, not all work is governed by strict process. Most office work is not. “Ways,” is another way of saying “habits” or “tradition” which are all words that are intimately tied to behavior. I choose the word behavior very specifically. Here are some dictionary definitions so you can see why. Behavior governs how we act, or decisions, or responses, and ultimately how we do our work. If it is our business cultural behavior or habit to focus on doing things quickly and in the easiest manner possible, would a reorganization and management directive cause everyone in the business to suddenly focus on predicting stability or making long-term decisions about quality? We may have new metrics and vocabulary, but the habits don’t change just because we gave a week of training and went back to work. Habits and behavioral change take place because of pressure to change. That pressure can come in many forms. As change agents, we can help the leadership plan those pressures through process change and leadership expectations, but we have only one real pressure available to us in our daily or hourly work. That is our interpersonal influence. The good news is, it is a very powerful pressure. Interpersonal influence is also that part of the equation that is lacking in most change plans that focus only on reorganizing and making management directives. Those fail because they don’t address the interpersonal level of change, which, of course, is where the real change happens. Change contexts. Changes in personal fitness are often much more effective with the incorporation of fitness coaches or workout buddies who hold us to our commitments. Weight loss works much better if our spouses and families are on board with the change in diet; it fails readily when they are not part of the change. The same phenomenon happens in the workplace when driving behavioral change. Saying that we are going to change isn’t enough. We must apply pressure to change though interpersonal influence and leadership at every level, executive leaders, middle managers, change drivers/program experts, and peer-to-peer. I’ve spent a great many words making the case for the importance of the interpersonal level of change because it is fundamental to successful change and to achieving the performance promised by the change. Let’s spend a few words discussing the key success factors of interpersonal influence. First, let’s just focus on positive, constructive influence; we’ll ignore negative influence which should be stamped out of course. Positive influence can only be obtained through trust. We don’t try new things unless we see the thrill or benefit of it, or unless someone we trust influences us to do so. When the former is hard to perceive, the latter is crucial. Therefore, whether an agent of change is a leader of personnel or an individual contributor, the key to influencing others to do things differently, to try something new, is trust. The following trust equation has been stated in several ways in several different presentations and resources in my library. I’ll offer it in my favorite terms without any credit to whom might have laid it out first since I can’t say for certain. It’s a simple equation, but not easy to always fulfill. It is also a very personal thing. It has everything to do with the person or the team of people. It has nothing to do with organization charts or management metrics. You wouldn’t trust a surgeon to work on your child if that surgeon had never performed the operation before. That surgeon may or may not be capable, but without the proof of it, you wouldn’t consider him a credible or trustworthy solution. Similarly, if that surgeon had a reputation for cutting corners or for allowing insurance company bureaucrats to make risk-based, cost-cutting decisions for him you would question his character and doubt if that surgeon should work on your child. I like the word “credibility” because it addresses both information and skill. Other words that have been used or proposed in its place include, proficiency, capability, and competence. Take your pick. The point is, for change agents to be influential they must be trustworthy. If you are an agent of change, you must be trustworthy. Chose your change agents carefully. They must have character that is honest, earnest, and endearing. They must also be able to demonstrate that they know what they are doing, teaching, or convincing others to try. That means that they must demonstrate more than just a certificate indicating they have received some training. They must prove competence to be credible. Part of the change planning must include some projects or programs that will vet the new way as well as the change leaders who will be driving the new way. My advice is to be bold, not conservative. Pick something big and important, something that affects the business and its personnel significantly. Involve everyone that is necessary and give each a do-or-die expectation. Make it matter. When those people successfully execute the new way, on something really big, it fulfills several criteria that will increase the trustworthiness of everyone involved, change agents, leaders, executives, and the program itself. Another element of the interpersonal influence and trust combination is this. People who do not trust, cannot be trusted. When you lay out the management directives for the business change, make the statement in italics the prime directive and mantra of management behavior. Understand that any time we do something new, and we change our habits, there is a learning curve. There will be mistakes and re-dos. When we discuss our new programs we often understand that, though we might wish it to be different, the change will not happen overnight and that it must occur in waves or cycles. We talk about it, but our behavior doesn’t demonstrate that understanding when we begin executing. We elect to do simple and easy projects first, like testing the water with our toes. This shows doubt in our own declaration of the future way, a lack of trust if you will allow. When a team fails to achieve the metrics performance targeted in a specific time, we punish the failure rather than reward the achievement we did make, discuss lessons we learned, and mentor further changes or understanding to facilitate better performance the next round. Don’t demonstrate a lack of faith (trust). Show faith that it will work and that your team is capable, and then coach them. Make it clear that every change agent, be he or she a manager, an executive, or individual contributor, is to exercise an understanding that learning is taking place and trust that those who truly endeavor to change will succeed. Focus on improving the behavior, on coaching, mentoring, and learning. The metrics will come if the behavior changes. Trust in those who try and those who learn. Trust that if the behavior changes the results will manifest. We have seen over and over again that simply reorganizing and changing metrics is not enough to truly change business performance. To truly change performance, we must change behavior. Behavioral change is made through interpersonal influence and leadership. The key to interpersonal influence is trust and trustworthiness. Chose agents of strong character and set them up to successfully demonstrate credible competence. Finally, demonstrate faith and trust in order to inspire personnel to try the new way without fear of failure and to encourage them to try to succeed. To achieve results, the focus must not be on metrics or results; the focus must be on behavior. Plan your change by adjusting executive and management behavior around trust and commitment, on learning and coaching. Coach each other first, and then begin coaching personnel. Apply the ideas above and break the cycle. Stop the insanity of repeatedly failed initiatives and change programs. Instead, plan the behavioral change, enable it with the reorganization and management directives, and execute the change through character and credibility. See the dramatic change that is possible and achieve the results you seek. It seems that in order to get an advice book published, one must be an accomplished CEO or exceptionally successful entrepreneur. And the advice in those books is geared for executives, often providing little value to those inside the bowels of a business. However, in my experience, some of a business' greatest minds and wisdom exist, not just at the executive level, but at all levels within. Some of the best leaders, from whom I have learned, have been program managers, line supervisors, chief engineers, and black belts. Some of the best problem solvers have not just been Lean Leaders or Master Black Belts, but also engineers, middle managers, and test technicians. This site is dedicated to capturing those ideas and insights from my own experience and from friends, colleagues, and peers. Advice is targeted for those working within organizations, where the "rubber meets the road" to help accomplish the little miracles that we all manifest every day to make the businesses we work within function better. I hope that some of the observations and advice herein are helpful to you. Content is the property of Alan Nicol and AlanNicolSolutions, LLC. Awesome Inc. theme. Powered by Blogger.